General Service Medal with Palestine 1945-48 clasp, to Airborne units. 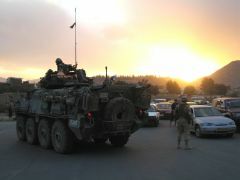 Canadian AFV and soldiers at a roundabout in Kabul, October 2005. How rare are R.A.M.C. 1914 trios?